STYX hurricane lanterns provide atmospheric lighting at every garden party. Thanks to the heat-resistant glass on the STYX hurricane lantern, the flame is protected from wind and water and burns with a steady flame. A practical handle also allows the hurricane lamp to be hung above a garden table as a light source. 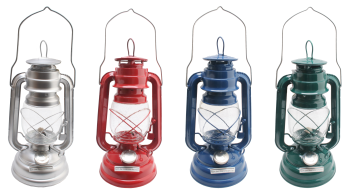 STYX hurricane lanterns meet with the standard DIN EN 14059:2002 for decorative oil lamps and are therefore child-proof.